Historic map of Menorca by Piri Reis. An Ottoman raid of the Balearic islands was accomplished by the Ottoman Empire in 1558, against the Spanish Habsburg territory of the Balearic islands. 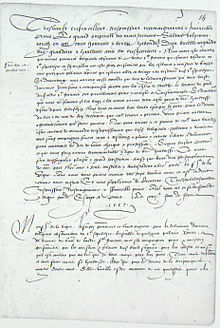 Letter from Henry II of France to Suleiman the Magnificent and ambassador Jean Cavenac de la Vigne, dated 22 February 1557. The Ottomans had already attacked the Balearic Islands many times previously, as in the 1501 Ottoman raid on the Balearic islands. 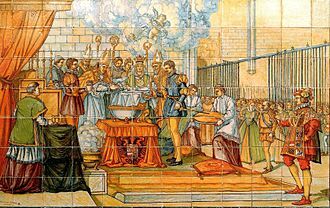 Then followed the sacks of Pollença (in 1531 and 1550), the Sack of Mahon in 1535, Alcúdia (1551), Valldemossa (1552), Andratx (1553), and Sóller (1561). 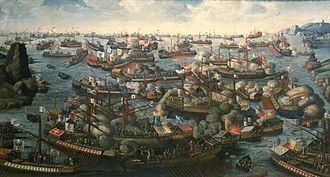 Ottoman attacks only decreased after the Battle of Lepanto in 1571, although they continued until the 17th century. On 30 December 1557, Henry II of France, who was in conflict with the Habsburgs in the Italian War of 1551–1559, wrote a letter to Suleiman, asking him for money, saltpeter, and 150 galleys to be stationed in the West. Through the services of his ambassador Jean Cavenac de la Vigne, Henry II obtained the dispatch of an Ottoman fleet in 1558. Suleyman the Magnificent sent his fleet as a diversion to help his French allies against the Habsburgs. The Ottoman armada left Constantinople in April 1558. On 13 June 1558 the Ottoman fleet ravaged Italy, with little effect however apart from the sack of Sorrento, then part of the possessions of Spain in southern Italy, where they took 3,000 captives. On 9 July 1558, the Ottomans under Piyale Pasha and Turgut Reis put the town under siege for eight days, then entered and decimated the town. After the fall of the citadel, the city was ravaged and the population enslaved. All of Ciutadella's 3,099 inhabitants who survived the siege were sold into slavery in the Ottoman Empire, along with people from surrounding villages. In total, 3,452 locals were sold at the slave markets of Constantinople. The Balearic islands were ravaged, and 4,000 people were taken as prisoners. As a later consequence of the 1553 Franco-Ottoman Invasion of Corsica, the same Ottoman fleet was delayed from joining a French fleet in Corsica near Bastia, possibly due to the failure of the commander Dragut to honour Suleiman's orders. Suleiman apologized in a letter to Henry at the end of 1558. ^ Pitcher, D.E., An Historical Geography of the Ottoman Empire (Leiden, 1972), p.99. ^ Lee, Phil, The rough guide to Mallorca & Menorca (New York, 2004), p. 275. ^ Carr, Matthew, Blood and Faith: the Purging of Muslim Spain (Leiden, 1968), p. 120. 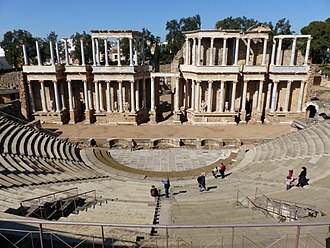 The Siege of Tripoli occurred in 1551 when the Ottomans besieged and vanquished the Knights of Malta in the fortress of Tripoli, modern Libya. The Spanish had established a fort in Tripoli in 1510, the siege culminated in a six-day bombardment and the surrender of the city on 15 August. The city was under the command of Father Gaspard de Vallier, the Ottomans had a base since 1531 in the city of Tajura,20 kilometers to the east, where Khayr al-Din had been based. The Ottomans encircled the fort, and established 3 batteries of 12 guns each, soon the soldiers in the fort mutinied, and negotiation for surrender started. The city was captured on 15 August 1551 by Sinan Pasha after six days of bombardment, the Knights, many of them French, were returned to Malta upon the intervention of the French ambassador, and shipped onboard his galleys, while the mercenaries were enslaved. 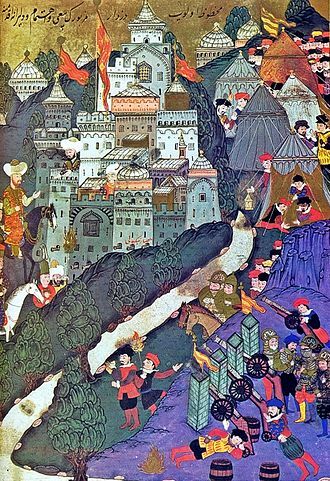 Murād Agha, the Ottoman commander of Tajura since 1536, was named as the Pashalik of the city, Nicolas de Villegagnon, the future explorer of Brazil, was present at the siege of Tripoli in 1551, and wrote an account about it in 1553. From Malta, dAramon wrote a letter about his intervention to Henry II, the role of dAramon was widely criticized by Charles V and Julius III on suspicion that he had encouraged the Ottomans to take the city. In any instance, dAramon had a relationship with the Ottomans. 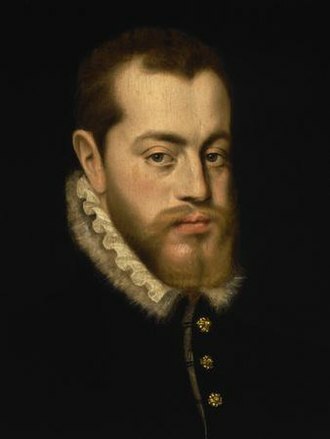 Upon his return to Malta, Gaspard de Vallier was heavily criticized by the Grand Master Juan de Homedes y Coscon who wished to all the blame for the defeat on him. He was brought in front of a tribunal, and stripped from the habit and he had been however staunchly defended by Nicolas de Villegagnon, who exposed the duplicity of de Homedes. The siege was the first step of the all-out Italian War of 1551–1559 in the European theater, in 1553, Dragut was nominated commander of Tripoli by Suleiman, making the city an important center for piratical raids in the Mediterranean and the capital of the Ottoman province of Tripolitania. 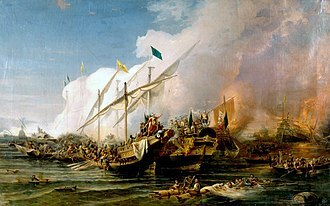 In a famous attack from Tripoli, in 1558, Dragut attacked Reggio, in 1560, a powerful naval force was sent to recapture Tripoli, but that force was defeated in the Battle of Djerba. The Invasion of Corsica of 1553 occurred when French and Corsican exile forces combined to capture the island of Corsica from the Genoese. The island had been administered since 1453 by the Genoese Bank of Saint George, the invasion of Corsica was accomplished for the benefit of France. The island had strategic importance, as it was located on the sea route between Spain and Italy, which was vital for the Holy Roman Empire. The French king Henry II had entered into a war with the Habsburg Emperor Charles V in 1551. The Ottomans, accompanied by the French ambassador Gabriel de Luetz dAramon, had defeated a Genoese fleet under Andrea Doria in the Battle of Ponza the previous year in 1552. On 1 February 1553, a new Franco-Ottoman treaty of alliance, the Ottoman admirals Turgut and Koja Sinan, together with a French squadron under Baron Paulin de la Garde, raided the coasts of Naples, Sicily and Corsica. The island of Corsica was occupied by the Genoese at the time, the Ottoman fleet supported the French by ferrying the French troops of Parma under Marshal Paul de Thermes from Siennese Maremma to Corsica. The French were supported by Corsican exiles under Sampiero Corso, the invasion had not been explicitly approved beforehand by the French king however. Bastia was captured on 24 August 1553, and Paulin de la Garde arrived in front of Saint-Florent on 26 August. With only Calvi remaining to be captured, the Ottomans, loaded with spoils, decided to leave the blockade at the end of September, with the Ottoman fleet gone for the winter and the French fleet having returned to Marseilles, the occupation of Corsica was jeopardised. Only 5,000 old soldiers remained on the island, together with the Corsican insurgents. Henry II started negotiations with Genoa in November, but Genoa sent a force of 15,000 men with the fleet of Andrea Doria, an Ottoman fleet sailed in the Mediterranean under Dragut but was too late, and only sailed the coast of Naples before returning to Constantinople. The French only obtained the cooperations of galliots from Algiers, by 1555 the French had been cleared from most of the coastal cities and Doria left, but many areas remained under French control. 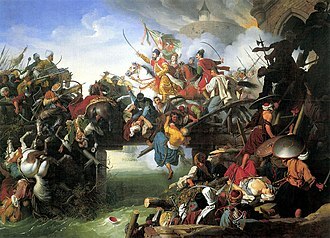 The Siege of Vienna in 1529 was the first attempt by the Ottoman Empire, led by Suleiman the Magnificent, to capture the city of Vienna, Austria. The siege signalled the pinnacle of the Ottoman Empires power and the extent of Ottoman expansion in central Europe. Thereafter,150 years of military tension and reciprocal attacks ensued, culminating in the Battle of Vienna of 1683. The inability of the Ottomans to capture Vienna in 1529 turned the tide against almost a century of conquest throughout eastern, the Ottoman Empire had previously annexed Central Hungary and established a vassal state in Transylvania in the wake of the Battle of Mohács. According to Arnold J. Toynbee, The failure of the first brought to a standstill the tide of Ottoman conquest which had been flooding up the Danube Valley for a century past. There is speculation by historians that Suleimans main objective in 1529 was actually to assert Ottoman control over the whole of Hungary. The decision to attack Vienna after such an interval in Suleimans European campaign is viewed as an opportunistic manoeuvre after his decisive victory in Hungary. Other scholars theorise that the suppression of Hungary simply marked the prologue to a and his brother-in-law, Archduke Ferdinand I of Austria, brother of Holy Roman Emperor Charles V, claimed the vacant Hungarian throne. Thus Hungary became divided into Royal Hungary and Ottoman Hungary up until 1700, Ferdinand set out to enforce his claim on Hungary and captured Buda in 1527, only to relinquish his hold on it in 1529 when an Ottoman counter-attack stripped Ferdinand of all his territorial gains. Estimates of Suleimans army vary widely from 120,000 to more than 300,000 men mentioned by various chroniclers, Suleiman launched his campaign on 10 May 1529 and faced numerous obstacles from the onset. Sickness and poor health became common among the janissaries, claiming many lives along the perilous journey, Suleiman arrived in Osijek on 6 August. The only resistance came at Pozsony, where the Turkish fleet was bombarded as it sailed up the Danube, as the Ottomans advanced towards Vienna, the citys population organised an ad-hoc resistance formed from local farmers and civilians determined to repel the inevitable attack. The war was a defeat for the Ottoman Empire, which lost large amounts of territory in Central Europe. The war was significant in that it marked the first time Russia was involved in a western European alliance. After Bohdan Khmelnytskys rebellion, when the Tsardom of Russia acquired parts of Eastern Ukraine from the Polish–Lithuanian Commonwealth and their leader, Petro Doroshenko, wanted to connect the rest of Ukraine with the Ottoman Empire, starting a rebellion against Hetman John Sobieski. Sultan Mehmed IV, who knew that the Polish–Lithuanian Commonwealth was weakened due to conflicts, attacked Kamianets-Podilskyi. The small Polish force resisted the Siege of Kamenets for two weeks but was forced to capitulate. The Polish Army was too small to resist the Ottoman invasion, after three months, the Poles were forced to sign the Treaty of Buchach in which they agreed to surrender Kamyanets-Podilsky, Podolia and to pay tribute to the Ottoman Sultan. When the news about the defeat and treaty terms reached Warsaw, the Sejm refused to pay the tribute and organized an army under Jan Sobieski, subsequently. After King Michaels death in 1673, Jan Sobieski was elected king of Poland, he tried to defeat the Ottomans for four years. The war ended on 17 October 1676 with the Treaty of Żurawno in which the Turks only retained control over Kamianets-Podilskyi and this Turkish attack led in 1676 to the beginning of the Russo-Turkish Wars. After a few years of peace, the Ottoman Empire attacked the Habsburg Empire, the Turks almost captured Vienna, but John III Sobieski led a Christian alliance that defeated them in the Battle of Vienna, stalling the Ottoman Empires hegemony in south-eastern Europe. A new Holy League was initiated by Pope Innocent XI and encompassed the Holy Roman Empire, Polish–Lithuanian Commonwealth, the second Battle of Mohács was a crushing defeat for the Sultan. The Turks were more successful on the Polish front and were able to retain Podolia during their battles with the Polish–Lithuanian Commonwealth, russias involvement marked the first time the country formally joined an alliance of European powers. Castelnuovo had been conquered by elements of various Spanish tercios the year before during the failed campaign of the Holy League against the Ottoman Empire in Eastern Mediterranean waters. The walled town was besieged by land and sea by a powerful Ottoman army under Hayreddin Barbarossa, during the siege the Barbarossas army suffered heavy losses due to the stubborn resistance of Sarmientos men. However, Castelnuovo eventually fell into Ottoman hands and almost all the Spanish defenders, the loss of the town ended the Christian attempt to regain control of the Eastern Mediterranean. The courage displayed by the Old Tercio of Naples, was praised and admired throughout Europe and was the subject of numerous poems, in 1538 the main danger to Christianity in Europe was the expansion of the Ottoman Empire. The armies of the Sultan Suleiman the Magnificent had been stopped at Vienna in 1529, Barbarossa captured the islands of Syros, Ios, Tinos, Kasos and besieged Corfu. The Italian cities of Otranto and Ugento and the fortress of Castro, in February 1538, Pope Paul III succeeded in creating a league which united the Papacy itself, the Republic of Venice, the Empire of Charles V, the Archduchy of Austria and the Knights of Malta. The Allied fleet for the campaign was supposed to consist of 200 galleys and another 100 auxiliary ships, but only 130 galleys and an army of around 15,000 infantry, mostly Spaniards, were all that could be gathered. 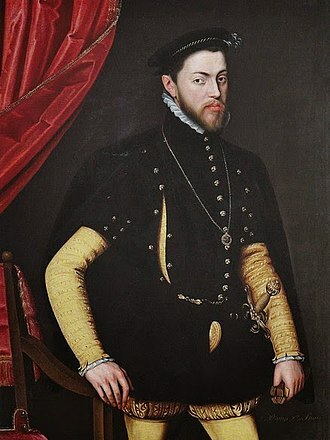 The commander of the army was unquestionably Hernando Gonzaga, Viceroy of Sicily, differences among the commanders of the fleet diminished its effectiveness against an experienced opponent like Barbarossa. This was seen in the Battle of Preveza, fought in the Gulf of Arta, but the Holy League fleet provided support to the land forces that landed on the Dalmatian coast and captured the town of Castelnuovo. This small town was a strategic fortress between the Venetian possessions of Cattaro and Ragusa in the known as Venetian Albania. Venice therefore claimed ownership of the city, but Charles V refused to cede it and this was the beginning of the end of the Holy League. The town of Castelnuovo was garrisoned with approximately 4,000 men, the main force was a tercio of Spanish veteran soldiers numbering about 3,500 men under the experienced Maestro de Campo Francisco Sarmiento de Mendoza y Manuel. This tercio, named Tercio of Castelnuovo, was formed by 15 flags belonging to other tercios, among them the Old Tercio of Lombardy, dissolved the year before after a mutiny for lack of pay. The chaplain of Andrea Doria, named Jeremías, remained in Castelnuovo along with 40 clerics, the reason for the garrisons large size was that Castelnuovo was projected to be the beachhead for a great offensive against the heart of the Ottoman Empire. However, the fate of the troops who were in the fortress depended entirely on the support of the fleet, moreover, in a short time Venice withdrew from the Holy League after accepting a disadvantageous agreement with the Ottomans. Without Venetian ships, the Allied fleet had no chance to defeat the Ottoman fleet commanded by Barbarossa, Sultan Suleiman the Magnificent ordered Barbarossa to reorganize and rearm his fleet during the winter months to have it ready for the battle in the spring of 1539. 10,000 infantry soldiers and 4,000 Janissaries were embarked aboard the warships to reinforce the troops of the galleys, meanwhile, used the peaceful months prior to the siege to improve the defenses of the town, repairing walls and bastions and building new fortifications. Ahmed Muhiddin Piri, better known as Piri Reis, was an Ottoman admiral and cartographer. He gained fame as a cartographer when a part of his first world map was discovered in 1929 at the Topkapı Palace in Istanbul. His world map is the oldest known Turkish atlas showing the New World, Piri Reis map is centered on the Sahara at the latitude of the Tropic of Cancer. In 1528, Piri Reis drew a world map, of which a small fragment still survives. According to his text, he had drawn his maps using about 20 foreign charts. For many years, little was known about the identity of Piri Reis, the exact date of his birth is unknown. His fathers name was Hacı Mehmed Piri, the honorary and informal Islamic title Hadji in Piris and his fathers names indicate that they both had completed the Hajj by going to Mecca during the dedicated annual period. When his uncle Kemal Reis died in 1511, Piri returned to Gelibolu, by 1516, he was again at sea as a ship captain in the Ottoman fleet. He took part in the 1516–17 Ottoman conquest of Egypt, in 1524 he captained the ship that took the Ottoman Grand Vizier Pargalı İbrahim Pasha to Egypt. In 1547, Piri had risen to the rank of Reis as the Commander of the Ottoman Fleet in the Indian Ocean and Admiral of the Fleet in Egypt, headquartered in Suez. On 26 February 1548 he recaptured Aden from the Portuguese, followed in 1552 by the sack of Muscat, which Portugal had occupied since 1507, and the strategically important island of Kish. 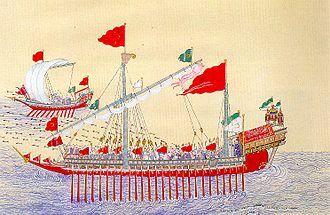 Turning further east, Piri Reis attempted to capture the island of Hormuz in the Strait of Hormuz, at the entrance of the Persian Gulf, unsuccessfully. When the Portuguese turned their attention to the Persian Gulf, Piri Reis occupied the Qatar peninsula to deprive the Portuguese of suitable bases on the Arabian coast and he returned to Egypt, an old man approaching the age of 90. When he refused to support the Ottoman Vali of Basra, Kubad Pasha, in campaign against the Portuguese in the northern Persian Gulf. Several warships and submarines of the Turkish Navy have been named after Piri Reis, Piri Reis is the author of the Kitāb-ı Baḥrīye, or Book of the Sea, one of the most famous cartographical works of the period. Assault on Livno (15 August 1878) by Karl von Blaas. Letter of Suleiman to Francis I about the plans for the Siege of Nice, written in mid-February 1543. Fort Mont Alban was built by Duke Emmanuel Philibert to reinforce coastal defenses following the siege of Nice. Turgut Reis, portrait by Ali Sami Boyar. French ambassador to the Ottoman Porte Gabriel de Luetz d'Aramont, was present at the siege. Siege of Belgrade in 1789. Austria restored Belgrade and other captured territories to the Ottomans. 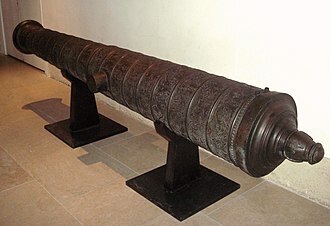 Ornate Ottoman cannon cast 8 October 1581 in Algiers. Length: 385cm, cal:178mm, weight: 2910kg, stone projectile. Musée de l'Armée, Paris. View of Castelnuovo in the 16th century. Engraving of an unknown 17th-century artist. 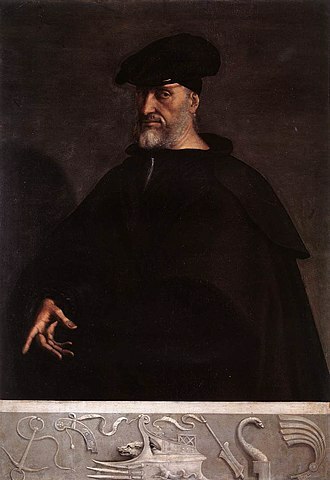 Portrait of Andrea Doria, c. 1520, by Sebastiano del Piombo. The Battle of Marciano in an ancient print. Kingdom of Croatia (pale brown), Republic of Dubrovnik (yellow), possession of Republic of Venice on Croatian coast (orange), and Ottoman Empire's Pashalik of Bosnia (green) in 1606. The Siege of Gravelines by Archduke Léopold in 1652, by Peter Snayers. Oil on canvas. Museo del Prado, Madrid.